When you are running a business it is crucial that all of the communication you have with your customers be proper and professional. You must suitably represent your establishment by identifying yourself and your company. In today’s era of social media, social communication, and social just about everything else, you may ask yourself, “Is there really anything that letterhead printing can do for me that the electronic world cannot?” The answer is a vibrant “YES!” Fundamentally, your clients will always place you in high regard when you show them the respect that is due to them by adding that personal touch. Sometimes hitting send takes little thought, and your clients know that. It has no life, no character and no identity. Sending out that personal letter shows potential and current customers that you value them, which in turn allows them to value you. Adding personality to your letterhead takes that relationship an extra step. Include a picture of you or something that represents your business next to the letterhead. Allow your clients to feel that they truly know your business/brand. 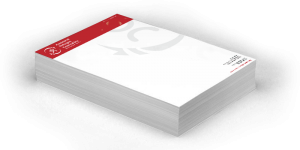 Sometimes overlooked, but painfully obvious, the letterhead can be used as a replacement business card which allows you to share your contact information on a much larger scale. This enables quick accessibility and reference to your company. Letterheads allow you to establish credibility with your clients. Think about it: If you are sending out an important letter to an important client, printed on plain paper on your home printer, you will appear commonplace and ordinary. That is the complete opposite effect that you are trying to have. When you take the time to plan out a well designed letterhead that contains all of your pertinent information on an attractive layout, you have the potential to outshine the competition as well as increase your chances for future sales and relationships. Opting for premium stock with a comfortable texture for a high class effect. Paper is a staple in any house. Why not have it be your letterhead? Paper is something that is always needed and used in any household. Your letterhead will always expose you to people for months or even years to come. It may trigger a thought, or a desire for your services. When all is said and done, a mailed letter always means more. 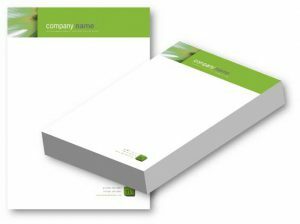 Letterheads will always be an essential part of any business. Create yours today.